How to draw portrait of Han Solo from Star Wars. 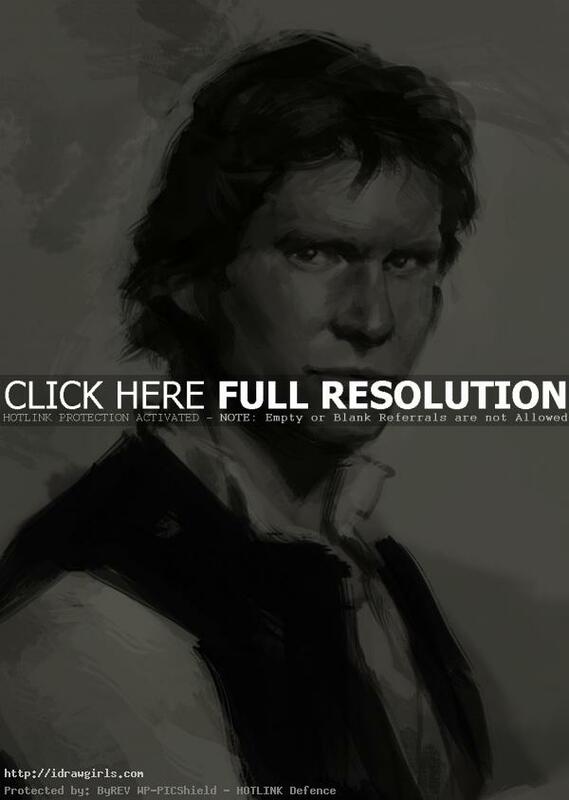 Learn to draw a realistic portrait of Han Solo. In this tutorial, I am using Photoshop as a painting tool along with Wacom Intuo tablet. This step by step tutorial might not be as easy for beginner, but if you already understand how to draw and shade, you will learn something from this. I am trying to mimic the charcoal drawing with digital tool. In this tutorial, you will learn to draw or digital painting using just values (more light and dark values than middle values in achromatic or black and white.) you create a high-contrastdrawing. The drawing resemble Han Solo played by Harrison Ford in the digital painting in illustration style. You will learn to draw facial structure or portrait from a rough sketch to finished black and white drawing of Han Solo from Star Wars. Han Solo was a Human from Corellia who achieved galactic fame as a member of the Rebel Alliance and later the New Republic. Born on Corellia, he was orphaned at an early age and taken by the pirate Garris Shrike to serve on his crew. He was treated cruelly, and served Shrike for many years before escaping while in his teens. Solo became a smuggler, and fell in love with Bria Tharen, though she left him due to her duties to the Rebel Alliance. Solo became caught up with the Rebel Alliance, courtesy of Obi-Wan Kenobi, Luke Skywalker and Princess Leia Organa, whom he helped rescue from the Death Star. Solo helped Skywalker destroy the Death Star when it attacked the Rebel base at Yavin 4, where they had taken Organa. Solo became an unofficial member of the Rebel Alliance, and fell in love with Organa. He helped destroy the Second Death Star at the Battle of Endor in 4 ABY, in which Emperor Palpatine was killed. A year later, the New Republic was founded. Here is a final portrait drawing of Han Solo. 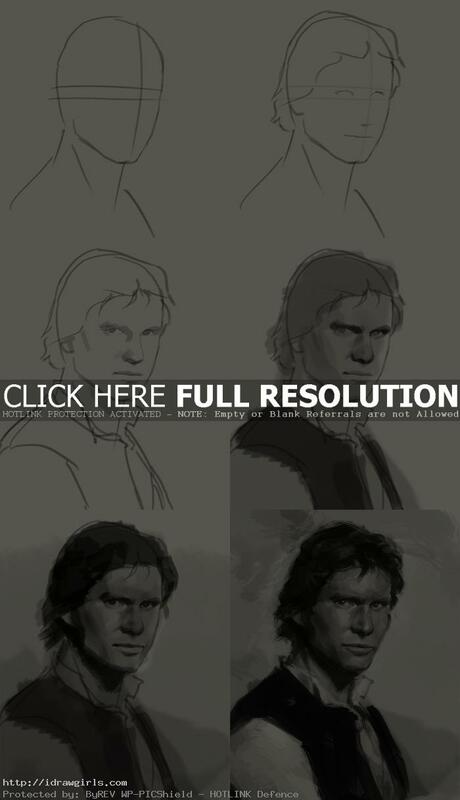 Below are step by step how to draw Han Solo. At the beginning, I usually start drawing the character using simple geometry shapes to get the basic idea down. It is an easy way to sketch out just shape first then draw over more solid detail. It is very important to get correct shape, proportion, and accuracy for initial sketch. This way, when you make a final drawing your drawing will be correct. Remember to always observe the character with keen eyes then keep it simple. Step one, I just sketch a generic basic portrait shape. (for more in dept detail on how to construct line for portrait go see How to draw face.) Step two, once I have foundation of the face, I can start draw eyes, nose and mouth guidelines. Step three, I can now draw over the foundation lines with real likeness of the person’s eyes, eyebrows, nose, and lips. Step four, I slowly shaded in simple dark and medium gray tone. Step five, I then drew in darker tone to establish more form and shadow on the face. Step six, I then had all the basic structure of the face I needed. At this step, I can start trying to get all the likeness of Harrison Ford in the drawing. Hey, r you going to do any Prototype 2? I wanted to do the Blackwatch soldier but I can’t find any good reference picture.